I’m gonna go with the guy on the left…. 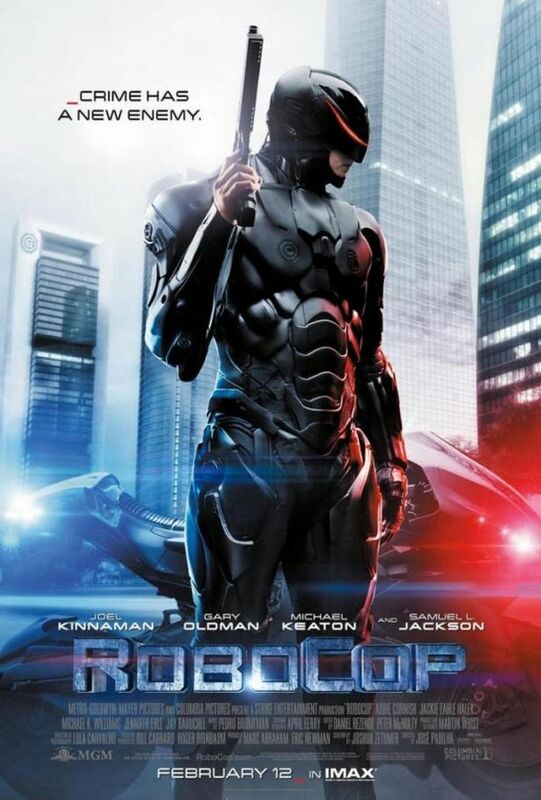 I’ve been seeing more and more promotional material for the new Robocop movie that apparently comes out next month. It was supposed to come out last year, but got pushed back to February. Release date changes are rarely a good thing, and based on the pictures of the “new” Robocop, this film won’t be anyway. 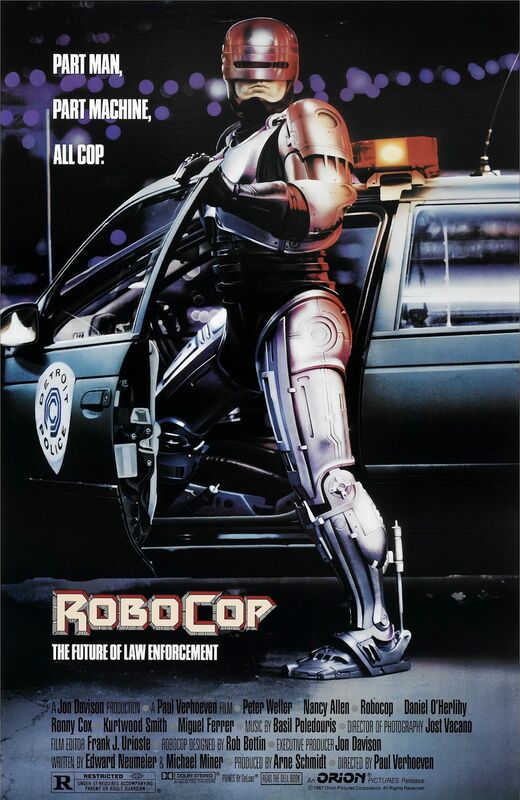 The first Robocop came out in 1987 and on the surface was a pretty straightforward science fiction action flick about a cop (Peter Weller) who is killed in the line of duty and then converted into a cyborg before going on a roaring rampage of revenge. Underneath, director Paul Verhoeven cleverly satirized and commented on corruption, capitalism, glorification of violence, greed and human nature. It covered these themes with a coating of ultra violence, which helped make the film “work” on so many different levels. It can be taken as just a good science fiction film, a straight forward action film or the multi layered total package. The effects and the story of Robocop have held up well over twenty-seven years. Now, they’re doing it again. Or at least they’ll try to. I doubt the film will be able to hold a candle to the original. I may be wrong, goodness knows I’ve been wrong so many times about so many things in the past, but when even Peter Weller, star of the original Robocop agrees with me I feel my opinion has some pretty solid footing. As he says, the remake can throw some CGI at it, but won’t be able to replicate the morals and themes of the original. And I haven’t even spoken about the dreadful new Robocop costume… If I’m the bad guy in this film, I think just shooting Robocop in his bare hand would be a pretty good strategy to open with. Feeling the need to release some tension, I watched Robocop two nights ago and loved it all over again. Five stars, easily. After that, I wanted more but I didn’t watch Robocop 2, I re-watched Dredd, and loved it all over again too. Ironic isn’t it that I watched a film that I’m dreading (no pun intended) the reboot of, and followed it up with one where the reboot really worked. Bottom Line: If they make sequels to the new Robocop and not to Karl Urban’s Dredd, that’s would be a real crime. Before the summer blockbusters came out, I compiled a list of the ones I wanted to see, that list has now evolved from a “to see” list to a “missed it” list, but now I’m crossing off number two, with the J.J. Abrams Star Trek sequel Into Darkness. It was enjoyable enough but difficult to review without spoilers, so be warned, I’ll try to be careful, but there are a few things I need to talk about. First, there thankfully seemed to be less lens flare than the first one. Second, there is something about these Abrams’ Star Trek films that just doesn’t seem Star Trek to me. Not all the time, but sometimes things slip in, and I just have to sigh a little bit. There doesn’t seem to be the big message of exploration, discovery, acceptance and social and moral responsibilities that the Roddenberry Trek had. They are there, but just not addressed enough to make it Star Trek enough to me…I know that some fans will grow up only knowing these newer Star Trek movies, just like there are children who will grow up thinking Jar Jar is representative of Star Wars. I was talking to a co-worker tonight about Into Darkness, and learned that he hadn’t seen Wrath of Khan. I don’t think you can appreciate either of these new Trek films without having seen TWOK, since both borrow so much from it. Remember the Kobayashi Maru test in the last one? Where do you think it came from? TWOK. The Into Darkness villain? Khan, and the worst kept secret of the summer. I do like what Abrams and company tried to do by keeping the villain’s identity a secret but in this day of blogs, Twitter, the IMDb and the antiquated print media known as magazines, this secret was spilled long ago. It’s also spelled out in the first line on the back of the DVD box so I guess Paramount gave up on maintaining the suspense too. Benedict Cumberbatch (Sherlock) was revealed to be playing Khan Noonien Singh, the villain from the classic series episode Space Seed and of course Star Trek II: The Wrath of Khan, played both times by the legendary Ricardo Montalban. 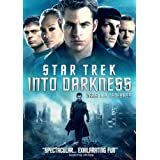 I’ll give Abrams and his crew some more credit: they do seem to do their homework, as parts of both the TOS episode and the film were adapted for Into Darkness. My biggest complaints about the new Star Treks are that they don’t really seem to use the “trinity” that existed in the original Star Trek properly. There was very little Kirk-Spock-McCoy, which made up the core of The Original Series; Spock being the mind, McCoy the heart and Kirk the balance. Now, Kirk is not yet a balancing factor and McCoy has been replaced by Uhura, which I suppose is a big step up from answering the phone on TOS, but for an old fan like me, it’s just not the same…. I’m still a little unclear why Spock needs a love interest, but as she has this role, Uhura does fit nicely as the new “heart” of the franchise. I would have liked to have seen more of Karl Urban, seeing his McCoy truly acting as the heart would have been very satisfying. After his excellent performance in Dredd 3D I wanted to see more of his acting range. They seem to have made Scotty a bit too much of a comic relief character, perhaps because they Simon Pegg. I suppose if you’ve got a fairly well known comic actor, you might as well use him for the comedic parts, but they can’t forget Scotty’s “genius” just for the sake of humour. I suppose these changes also come from having a primary crew of seven (or eight) characters and casting “name” actors for each. You have to make sure that every actor gets their screen time, but too many cooks spoil the broth. I’ve got to say that I have really enjoyed all the casting decisions for the rebooted Treks, and hope that if they continue, Alice Eve returns as Dr. Carol Marcus. After each scene, I wanted to see more of both the character and the actress. My bottom line on Star Trek: Into Darkness is that it was fun, the action was good, but the sci-fi or Star Trek elements were a little down played for my liking. I would have to say this was a must see for Star Trek fans, though maybe not Star Trek enough for die hard purists. If you’re a newer fan, you definitely need to watch Star Trek II: The Wrath of Khan, though I’m not sure if you would benefit more by seeing it before or after Into Darkness. I know that after watching it I wanted to pop TWOK in right away but think I’ll save that for the weekend, and watch it with my kids, who have never seen it, but did see Into Darkness before I did. So Sunday night I went to see Dredd 3D, and I must say that I really liked it. As soon as the movie started, so did the action, and it didn’t really let up for the remainder of the film. As Judges Dredd and Anderson are making their ascent up the Peach Trees Mega Block, there was lots of creeping around corners and this did slow up the pace once in a while, but when it lacked action, the film made up for it with some pretty good suspense, and some pretty fitting music too. Actually the soundtrack was excellent for the mood the film was conveying. Nothing I personally recognized, or would probably listen to, but it all fit well for the movie. Dredd (or Dredd 3D if you must) is set in the future, where the world is a wasteland. Mega-City One is a massive walled city-state stretching the east coast of America, with giant buildings called Blocks housing more than fifty-thousand citizens built on top of the remnants of the old cities. To maintain law and order, the city is split into sectors, and policed by Judges, who are literally “judge, jury and executioners”. A judge rides his “Lawmaster” motorcycle and uses his “Lawgiver” pistol (equipped with ten different types of ammunition) to deliver sentences on the spot to any and all offenders in Mega-City One. Mega-City One looked pretty amazing on the big screen. Though the scale of the city and buildings was massive, nothing looked too unbelievable or too “futuristic”. The buildings, the vehicles, and even the wardrobe/costumes of the citizens (and judges) all looked very real. I think I read on one of the movie prop boards that I frequent that most of the Judge costumes looked to be just slightly customized motorcycle gear. That’s not such a bad thing. “Cosplay”; or dressing up as your favourite fictional heroes; is growing in popularity at parties, conventions and don’t forget Hallowe’en is just around the corner; so to give the fans a costume that can be realistically achieved without a tremendous amount of building skill is pretty cool on the part of the filmmakers. Sure sets of motorcycle leathers are expensive, but if you already have a motorcycle, fandom could be a great excuse to get another set. It was also nice to see a “futuristic uniform” that still looked functional and practical. 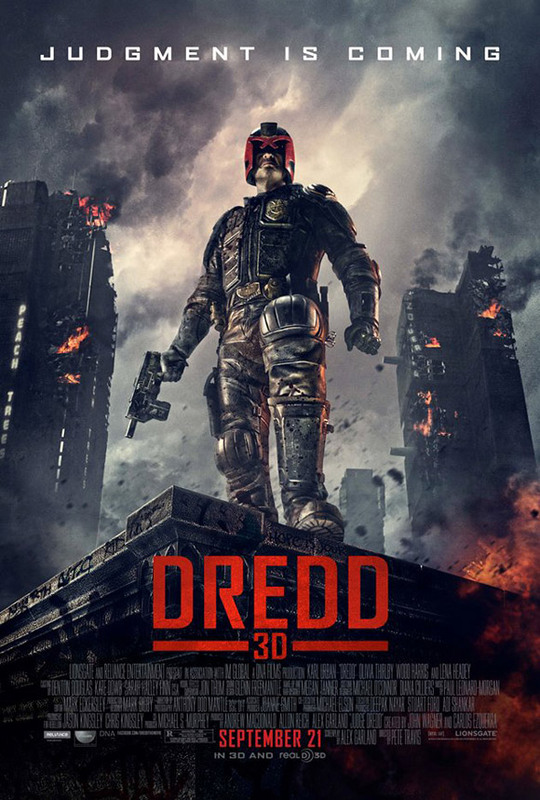 Dredd follows Mega-City One’s Judge Dredd (Karl Urban), the toughest judge in the city; as he takes a new recruit Judge Anderson (Olivia Thirlby) on a final assessment ride along to determine if she has what it takes to become a judge. Anderson is a mutant with advanced psychic abilities who was 3% below the passing grade from the Academy of Law, but the Chief Judge wants Dredd’s opinion if they should pass her anyway. Investigating a triple homicide inside a block called Peach Trees, Dredd and Anderson uncover a drug operation being run by a ruthless gang leader known as Ma-Ma (Lena Headey). Not wanting her operation interrupted, Ma-Ma locks down the entire block and effectively holds the citizens hostage inside, until someone kills the two judges. What follows is an incredible amount of blood, shooting and violence as justice is dished out the only way it can be in Mega-City One. I had heard that the 3D in this film was supposed to be phenomenal, and it was very good. While on the drug “Slo-Mo” the user perceives everything in slow motion. A real time second seems to take an hour to pass for a user. When seeing things from the user’s perspective on Slo-Mo the 3D really came out. Slow motion glass was broken and thrown out from the screen, and the bullets tore through bodies, flying towards us, pulling trails of blood in their wake. During these scenes, there was a lot of blood, and I suppose a lot of “gore”. A bullet rips through a criminal’s cheek and comes out the other side; Dredd definitely deserved the 18A rating (remember I’m in Canada), and I’m not usually a big fan of blood and gore, but this time out it was actually rather stylized, and again it “fit” for lack of a better word. In the end, the film looked very good, but again, I’ll stick to my story that 3D means “3 dollars more”; it really doesn’t seem necessary, but at least this time around it didn’t hurt the film as it has others in the past; Clash of the Titans anyone? In preparation for the film I did manage to acquire the first five compilations of the Judge Dredd comics from 2000 AD. In their collected format, they were presented in black and white, and most of the stories were very good. The Judge Dredd comics were presented in a weekly magazine along with other stories, beginning in 1977. The stories were short, with longer tales spanning multiple issues. The movie really did stick true to the character as I understood him, and it was nice to see that the story on the screen was not just something rehashed from the original pages, well at least not the ones that I have read. Karl Urban did a pitch perfect job as Dredd bringing the inked page to life, and his performance seemed to channel a little bit of Dirty Harry into Mega-City One. Though I haven’t seen the original Stallone Judge Dredd film and I do plan on seeing it fairly soon; I think it’s safe to say that Urban’s performance will prove to be head and shoulders above that of the earlier movie. I had forgotten that Urban had previously stood out as Dr McCoy in the Star Trek reboot, perhaps I didn’t make the connection because Urban wears the Judge’s helmet throughout the film. His Dredd is man who cares for nothing but the law, but a man who you want to cheer on as he dispenses justice left, right and centre. The flip side to Dredd’s emotionless machine, comes from Anderson, a slice of humanity in Mega-City One. About a month ago I watched the movie Margaret with Anna Paquin and I noted that there was an actress who was in just a few small scenes, but for some reason her performance just really struck something with me; that actress of course was Olivia Thirlby. Thirlby plays Judge Anderson in Dredd, and was a big “plus” for this film, again being a character you want to cheer on, but in a slightly different way from Dredd. Anderson didn’t wear her helmet through most of the movie because she claimed it interrupted her PSI abilities, which was a clever work around by the writers to let the audience see her face, which again showed us the emotion absent from Judge Dredd. After watching Margaret, I jumped on IMDb, to see what else she had been in; and I haven’t seen any of them, but seeing that Miss Thirlby was in The Darkest Hour and Being Flynn, has put both films higher on my “to watch” list. I was glad to see that she was going to be in Dredd and a few other upcoming projects, not only is it good for her and her career, but it also confirms that someone else out there, in Hollywood or wherever, saw something in her too. Just kind of makes me think I almost know what I’m talking about sometimes, regardless, I’m glad that there will be more chances to see this talented young actress. The budget for Dredd was an estimated $50 million, and a high quality film was possible by setting it almost exclusively inside the Peach Trees facility. Hopefully this relatively “low budget” will translate into large box office numbers, which will certainly justify a sequel. Dredd was quite simply a superior action film, and certainly good enough to satisfy fans of the character and the genre. The reaction has been so positive, fans are not only asking for a sequel, but they’re calling for a trilogy, and I think that really says it all.